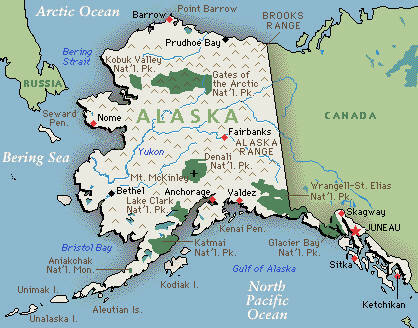 History of Alaska. Information that every Alaskan Election Candidate for Congress Senator Should Know. Alaska is bordered by the Yukon Territory and British Columbia in Canada, to the east, the Gulf of Alaska and the Pacific Ocean to the south, the Bering Sea, Bering Strait, and Chukchi Sea to the west and the Arctic Ocean to the north. Alaska's territorial waters touch Russia's territorial waters in the Bering Strait, as the Russian Big Diomede Island and Alaskan Little Diomede Island are only 3 miles (4.8 km) apart. With the extension of the Aleutian Islands into the eastern hemisphere, it is technically both the westernmost and easternmost state in the United States, as well as also being the northernmost. Alaska is the largest state in the United States in land area at 586,412 square miles (1,518,800 km2), over twice the size of Texas, the next largest state. 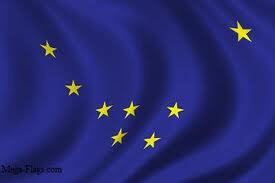 Alaska is larger than all but 18 sovereign countries. Counting territorial waters, Alaska is larger than the combined area of the next three largest states: Texas, California, and Montana. It is also larger than the combined area of the 22 smallest U.S. states.